Fishing: Once you go Bass, you never go back? Darth Bass didn’t stop at subliminal or blatant tweets either. I think he knew I would be a tough sell, a Luke Skywalker ambassador of the trout and fly fishing world. So he sent, via the snail mail, a package packed full of temptations and ‘whoa, what the hell do I do with these?’ that would motivate me to investigate the mysterious side of bass fishing. Because I catch trout that are 8 inches long and one of the lures Darth Bass sent was an 8 inch long trout that looks amazingly real, I did what any trout purist would do…..I got on the phone with the only Bass Fishing Guru I know. Terry Battisti is a bass fisherman and writer for several publications in the Bass arena. He’s also the only person I know with a bass boat, lives in Idaho and likes to talk fishing and writing at the same time with me. 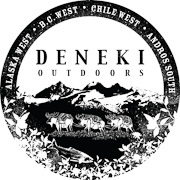 When I explained my bewilderment over the lures and the attempt at bass fishing conversion by Dennis (Darth Bass) he assured me all would remain balanced in my world. So plans are now made. Rebecca, the fly fishing, trout loving disciple will be going bass fishing with my new Huddleston Swimbaits (<~~link to their website) come April or May with Terry as my bass guide. I’ll go ahead and admit this now ~ Damnit Darth Bass, I think you got me, I’m excited to go Bass fishing now! Someone help me…. In the meantime, I did ask Terry one final and important question. I’m not sure about the bass where you and Darth live, but the bass here can get quite big. Funny thing is, they stocked lakes in California with the Florida strain and they pull 20 pounders out of there all the time. They get big while feeding on 12 inch rainbow trout. I’m telling you Rebecca, after you get Popeye arm casting to tailing redfish one day, the next move you’ll be making is to Florida…. I’ve got a nice little package of saltwater flies that I tied for you. As soon as I’m able to actually get into the post office (maybe after Christmas) I’ll mail them off for you. I don’t think the bass get that big around here in my parts….Boise Idaho area…..but I can’t confirm. Feeding on a 12 inch rainbow trout??!! Good hell, the monsters! Ok. Bass first, then it will be redfish and pretty soon I’ll be one of those good all around fisherman. Sounds like I’ll have to plan a trip to the great big blue body of water. Darn, I hate it when that happens…. Oh yeah….I forgot to tell you….don’t tell anyone but (whispering now) I’ve got an 8 foot 6 weight that i take bass fishing from time to time. Golf course ponds never see anglers and are always stocked with bass…. By no means should you leave your fly rod at home just because you’re going to the dark side…big bass poppers can entice violent surface takes by bass…or so I am told. I’ve only angled with a fly for bass once, and all my hookups were on woolly buggers down deep in the weeds. 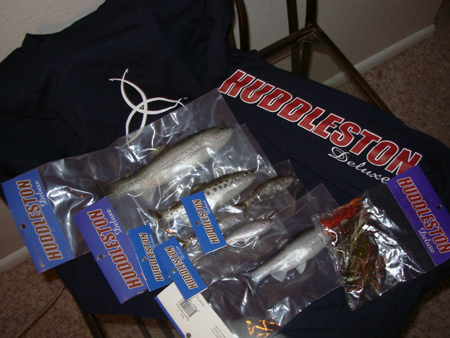 And BTW, those Huddleston Swimbaits look remarkably like Air Fresh Trout, to me! How do they smell? Sure sounds like something you’ve experienced….do you go both ways but have been hiding in the closet about it on your blog? I’m sure you meant to say: Rebecca, the fly fishing, trout loving disciple will be going bass fishing with my new Huddleston Swimbaits and my daughter Kaitlyn come April or May with Terry as our bass guide. Hmmmm….I don’t know Kaitlyn. I guess I might have meant to say that if you have changed your vote over the whole swimming pool/trout pond debate. Okay, how about this: Swimming pool for summer, pond for spring, fall and winter. Deal? Now will you take me fishing? Please? not taking a child fishing………is child abuse……. LOL the child in question has been fishing with me since she was a baby and I threw her in one of those baby backpacks. She’s personally been fishing since she could hold a rod….fly fishing since she was about 5 years old. I promise, she is not abused or left out in any way. Hmmmmm….. two women in the boat at the same time? That’s a lot of estrogen. I think I can handle that. If you end up having too many of those Huddlestons, I have a good home for them! I guess I’m too late trying to keep you from the dark side. Seems you’ve already slipped. I, on the other hand, have only caught one Bass, that being by accident. I was fishing for trout with a Gold Panther Martin and a Small Mouth took it. Oh, wait! I did catch one, other again on a PM, but it it was so small I could hardly tell what it was. Keep resisting. You’re going to need at least an 11 or 12wt to throw those swimbaits around. Fine, use a bait caster instead. I don’t know Clif, I liked your first idea. I like the idea of using a mega-fly rod to heft those massive lures around. In doing so, I could still hold onto my fly fishing religion and add a touch of the dark side in. @Wolfy ~ duly noted. If I find I can’t handle them, it’s good to know they have a home already offering adoption. @ Clif ~ LOL well, at least I would have an excuse to buy a tougher fly rod and if the Bass fishing fails, I could take it to some big waters. Ocean fly fishing anyone? Kind of like me going from (30) years worth of fly fishing only, to fishing plastics for trout, perch, bluegill, and “Bass”. The dark side ain’t so bad, if that is what they call it. I will wait to hear how your experience goes with those big lures. I’ve got a good bunch of buds in Virginia/MD/WVA who are die hard smallie fisherman on the rivers, and all they cast are hand-tied flies on 5 wts. I grew up chasing bass. I’ve got to tell you, learning how to fly fish gave me a whole new appreciation for my time on the water…regardless of the species I’m after or what I’m after them with. The only thing you need to fight, Rebecca, is more fish on your line. Ok, coming from someone who has walked on both sides of the proverbial fence here. I’ll say this.. The first fish I ever caught was a trout. I spent most of my younger years fishing lakes in South and North Carolina with my grandfather (being born and raised in Western NC was kinda nice to have the best of both worlds right in your back yard). I’ve caught many bass, largemouth and smallmouth. They are extremely fun fish to catch, VERY particular fish as well. Rebecca, you WON’T be disappointed. Yes, take your shiny new 7 or 8 wt with you. 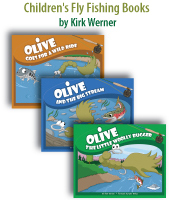 Grab up some poppers, leeches, clousers, and other streamer patterns, and hang on! I had a friend that I used to bass fish with back in the old days. He would bring a fly rod in the boat, and when we could catch them on top, well, he’d put down the casting gear and whip out his 7 wt and go to town with poppers. He caught quite a few that way and some decent sized bass. Now, if you’re going to fish for bass, there’s a thing or two you might want to unlearn, or at least segregate from trout fishing. When you’re bass fishing, if it’s over 12″ it is measured in pounds, not inches. You rarely ever hear someone say, I caught a 28″ bass. What you normally hear is.. I caught a 7lb bass or simply a 7 pounder. On to lures, you have Swimbaits, jerkbaits, top water poppers and stickbaits, crank baits, soft plastics, jigs, spoons, spinnerbaits, buzzbaits, jitterbugs, devils horse, zara spook, are all very productive lures, and every tackle box should be outfitted with some of each in various colors and sizes. Also varied hooks from 1/0 to 4/0 and sinkers from a 3/4oz egg sinker (for Carolina rig) to a 1/8 oz bullet sinker (Texas rig) and different sizes of each for those really fussy fish that won’t bite anything else. Oh and don’t forget the swivels. In our world of fly fishing the cost is absorbed in the fly rod, reel, and line. Our flies are inexpensive compared to bass lures. One lure can cost upwards of $15.00 sometimes more. Now to loose one of those makes one cringe at the thought. Figure a bass angler has several tackle boxes full of lures at an average of $5-$6 each and he may have several hundred different lures. Now tack on the cost of his rod and reel (average @ $100 for a fair to decent rod and $100 for a fair reel) his hobby is looking about just as spendy as ours is! Not to mention his bass boat! All in all Bass fishing is a wonderful sport and a helluva great time! I think you’re gonna love it! Enjoy your time on the lake! it’ll be fun! @Dave Thank you for sharing your words of wisdom. Now, I’m sick if I lose one little fly. I imagine I would dive into a lake to retrieve a lure that costs upwards of 15 or more dollars! So basically, the bass fisherman put the big bucks in their lures. We fly fisherman put the big bucks into our fly rods. A sense of balance in the force….. I see this one little article triggered by Rob has opened Pandora’s box Rebecca. Seems like most if not all of your “fly fishing” buddies has, at one time or another, fished bass (GASP!). I’ll be over in the April/May timeframe to get you on the water. I know you’ll enjoy the fishing aspect of it. I’m just worried about getting you IN the boat. By the way, I’m heading to Lake Powell in the morning for a week of bass and striper fishing. Hopefully it’ll be a lot warmer than the Arctic Tundra of Idaho Falls and the fish will cooperate. Be good and a very good read as usual. 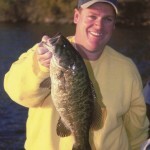 Smallmouth bass are great fun to fish, especially on the ole fly rod and from my float tube. I have introduced a lot of people to float tube fishing for smallies but I have to say that fly fishing for chain pickerel from a float tube is right up there with smallmouth bass fly fishing. I start fly fishing brook trout from the float tube first and we caught some nice brookies but most were in the 8 to 10 inch range. Just right for a shore lunch. I got so caught up in fly fishing for bass, pickerel and salmon I sort of left trout fishing behind. I have to get back to fishing some of my old trout hot spots. So…this bass trip must be coming up soon. You haven’t changed your mind have you? 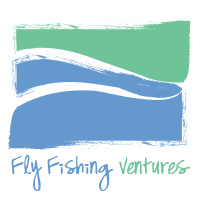 Next post: Dear Santa, I hope you’re a Fly Fisherman…….